You'll be £14.99 closer to your next £10.00 credit when you purchase Images of the Past: Wembley. What's this? It was the field of dreams, the birthplace of legends, the hallowed home of our sporting gods. Historic Wembley Stadium, with its iconic Twin Towers, was truly the most revered of venues. Until the Millennium, when the world-renowned colossus was demolished to make way for its futuristic replacement, the famous old Stadium witnessed some of the most heroic events of the Twentieth Century. But its history, although always exciting, was also often uncertain– and not a little bizarre. So, despite most eyes being on future fixtures as the sporting hub heads towards it centenary, it is the ancient edifice’s often forgotten past that is the subject of this book. And the uncomfortable truth is that Wembley’s original debut was anything but auspicious. In fact, it was once viewed as a debt-ridden disaster. So doomed was it deemed to be that the North London complex was about to be knocked down – and was rescued only at the last moment, in the most extraordinary circumstances. Happily, it recovered to become a success story, the memories of which are recorded here, hopefully to open the floodgates of nostalgia for followers of sport. Wembley, it must be remembered, came to the rescue of the first post-War Olympics when no other nation on earth would accept the challenge. It gripped greyhound racing aficionados and it thrilled to the roar of speedway stars. The giants of American football also muscled in to display their skills there. Great Britons like Frank Bruno and Henry Cooper stepped into the ring (and Cassius Clay was felled to the canvas) before stunned boxing fans. And, of course, Wembley crowds gasped in awe at the footwork of Stanley Matthews and wept in ecstasy at the triumph of Bobby Moore. But the North London location is more than just the Holy Grail of sport. It has seen defining moments in pop music history, such as Live Aid. It has given platforms to the Pope and evangelist Billy Graham. It has staged breathtaking spectaculars no other venue could hope to accommodate, growing in stature over the course of an astonishing century. 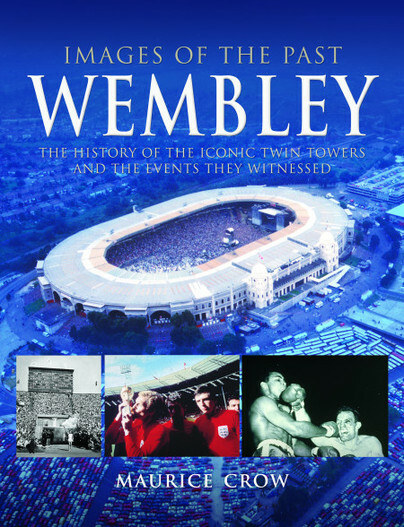 This then, for both sports buffs and social historians, is historic Wembley’s story … an unfolding saga played out beneath those symbolically soaring Twin Towers. It’s quite brilliant in every regard, like visiting a museum or watching a documentary but obviously better. You can’t miss with this one. Wembley has been in the news as of late thanks to an offer from billionaire Shahid Khan to purchase the iconic stadium. The offer, which could be in excess of $1.3 billion, made headlines all over the world. Why? It’s simple: Wembley has a special place in everyone’s heart as the home of the English national team and the FA Cup. But there’s a greater history that many are unaware of. Maurice Crow’s Images of the Past: Wembley from Pen and Sword Books provides that history in an absolutely enchanting read. While the focus is one-of-a-kind photography, the photos are complemented by well-written content at every step of the way. You’ll learn of Wembley’s rich sporting history, a history that extends well beyond the beautiful game. Wembley is the heart of English sport as a whole with major rugby, boxing, speedway, and greyhound racing all taking place on the iconic grounds. It also has a prime history in entertainment history with major concerts assembling there over the decades. And you can’t forget the World Cup and the Olympics. Wembley is the heart of it all. This book brings history to the modern day, providing a trip down memory lane for readers. It’s quite brilliant in every regard, like visiting a museum or watching a documentary but obviously better. You can’t miss with this one. I am not a fan of the new Wembley stadium, I think it might have been better to retain the old one as a place of interest, and to build the new stadium elsewhere in Wembley - but I'm probably in a minority there. This marvellous book captures and relives some of the most brilliant events held at the old Wembley - how brilliant it would have been had Jeff Lynne and his ELO played at the old stadium! A brilliant slice of nostalgia. Maurice Crow takes us on a fascinating pictorial journey down memory lane.